"Joel's ebook is the best ebook I ever invested in. I wasted $90 on another NEMT ebook which proved to be nothing but preformatted crap I could have got any where! Despite that initial setback, I took a chance on Joel's ebook which was the single best investment - I recommend it to anyone serious about the NEMT business." Caring-For-You Transportation "This is the Bible of the NEMT industry. This ebook gave me my start. I left UPS after 20 years and started my own NEMT business. I have since expanded into courier, rentals, and now the home care industry. I still refer back to Joel's ebook for counsel." Western Carolina Medical Transportation "….if you are serious about being successful in the NEMT business then this is a must read. I hesitate to buy things online but I couldn't pass this opportunity up. I am glad I didn't. I continue to study Joel's material and follow his step by step advice and study his DVDs. I recommend Joel's material from first hand experience." Wilkes & Miller Enterprises, Inc. I would like to share my experience with Joel Davis for anyone thinking about starting an NEMT business and enlisting Joel’s help. My business partner and I started our company in 2014. We purchased Joel’s material and studied his DVDs. We were off to a great start and doing very well when, tragically, my partner unexpectedly passed away in 2016. This was a very difficult time for our company and respective families. Further complicating this difficult ordeal was the unexpected legal battle between my business partner’s widow and our company. Without disclosing all of the associated details, they claimed our business was valued at much more than it was. Had they won, we would have had no choice but to sell immediately or close our doors. Not sure of what to do, I reached out to Joel and retained his services. Joel performed an executive business evaluation for our company and worked closely with my attorney. Joel’s findings directly refuted what the plaintiff, their attorney and their business broker claimed our business was worth. This legal dispute went to trial in early 2018 and Joel was called to testify as an industry expert and to provide testimony of the value of our company at the time of my partners passing. In April 2018 we received the judge’s ruling who agreed with Joel’s valuation of our business. Needless to say, Joel’s help was critical in helping us keep our business and bring this lengthy and costly legal dispute to a close. I cannot thank Joel enough. We used Joel’s information to get started, which was great, but nothing compared to his help when we needed it most. Joel really is The Authority in the NEMT industry and I encourage everyone to listen to his advice. I know everyone claims to be a guru or an expert and there is a lot of stuff online, but I encourage you to consider the source because when you least expect it you might need real help. After personally working with Joel during this difficult time and relying on his expert testimony, I gladly tell everyone Joel is the real deal. Welcome to the Non-Emergency Medical Transportation Industry, an industry that's literally growing by the day. How do I know? Because the elderly population is literally in the process of doubling and the medical industry is experiencing huge change. Further, I know because I started my first company, a NEMT business in 1999. Since then, I have help and untold number of transportation providers and entrepreneurs from all across the country to grow, build, expand and diversify their NEMT businesses. So what is Non-Emergency Medical Transportation (NEMT)? Also known as an ambulette service, NEMT is the transportation of people in wheelchairs, stretchers or those ambulatory who need assistance. Do NOT be confused: This is NOT an ambulance service! This is strictly non-emergency transportation. You do NOT need any kind of special life-saving skills, training or equipment! With your NEMT service, you will transport people to and from medical appointments, in and out of hospitals, nursing facilities, or from residences to various medical appointments. Your two niche markets, the medical industry and the elderly population, are not just growing, they're exponentially booming! The elderly population is the fastest growing niche market in the world - and it's only getting bigger! By the year 2030, the US elderly population will have doubled, reaching in excess of 70 million! The US health care industry is one of the world's largest and fastest growing industries! By the year 2016, the growth of the US medical industry will have consumed almost 20% of our GDP! Now seriously, if you have any kind of keen business sense then these two statistics, the growth of the elderly population and that of the medical industry, have got to excite you and gain your interest! But let's discuss in further detail why starting a NEMT business is such a great investment for ambitious, motivated entrepreneurs. For starters, rarely do entrepreneurs think of this kind of business when looking for a business opportunity. Seriously, everyone is focused on the get-rich-quick schemes and no money down pie-in-the-sky dreams of riches. Seriously, when was the last time you heard someone say "I think I'm going start a NEMT business?" The fact of the matter is you probably haven't. But you probably know someone, if not even yourself, that has started some kind of "no money down" real estate gig or some other online pie-in-the-sky dream. So realistically, we are talking about a business opportunity for which (1) your target market is booming, growing faster than any real estate market or any other market, and (2) not everyone knows about, let alone considers, when looking to invest in a new business. This is further a great opportunity is because it is a service-based business. There are no products to buy, store, ship or sell. And when you follow my strategies for success, people will be looking for you. They will be looking for your business to meet the needs of their loved one. If you prepare and operate your business properly, clients will be seeking your service instead of you having to continuously find, chase and solicit customers! As I did, and so many others, you can literally start your NEMT business from your living room table, your home office or garage. You are going to travel into your community to meet the needs of your clients. You don't need a high-priced fancy office or an elaborate store front to encourage business. Think about it. What's cheaper or more cost effective? Invest in a vehicle that goes out into and meets the needs of your community or invest in real estate for a retail business, franchise, or some other traditional business idea? And when you start a business from home, it definitely limits your overhead expenses which lead to a BIGGER bottom line and profitability! Now that we're talking about profitability, let's really start to talk about making money! These are clients who typically pay "out of pocket" for transportation to and from medical appointments. This will be a highly profitable source of revenue for you. There are many transportation providers who ONLY transport Private-Pay Clients because of the higher rates of reimbursement. For them, pursing other sources of revenue is simply not worth their time. They are simply too busy cultivating their Private-Pay clients. Talk about FREE healthcare?! Medicaid recipients not only receive FREE medical benefits but, according to Article 1915 of the Social Security Act, recipients also get FREE transportation to and from their medical appointments! But the good news for you, the transportation provider, with Medicaid, depending on your State, you can generate some serious reimbursement checks that you will love receiving in the mail - like clockwork! Similar to Private-Pay, there are some NEMT providers who ONLY service Medicaid clients. Why? Because if they have negotiated a good contract with the Broker the reimbursement rates are profitable. This reimbursement is for transporting people hurt "on the job" who need to get to and from physical therapy and related medical appointments. Workers Comp is one of the few forms of insurance that reimburses for NEMT and can be an awesome source of revenue that also pays extremely well. Again, some transportation providers ONLY cater to Workers Comp because the reimbursements are just that profitable! Workers Comp is a great opportunity. Imagine how profitable your business can be when you have a Private-Pay, Medicaid, and Workers Comp clients. The possibilities are limitless! Hospitals are an awesome opportunity for your business. They offer a wide variety of NEMT opportunities. They provide Emergency Room discharges and “General” hospital discharges. Their inpatients require transportation to and from different treatment facilities, doctor offices, dialysis centers, and other offices outside the hospital. Hospitals also require a great deal of delivery and courier services. Bottom line, hospitals are an awesome source for which to secure contracts and repeat business. They are ALWAYS in need of transportation! Nursing homes and independent living facilities are a "staple" for the NEMT industry. Why? Because they literally care for one of your most important niche markets - the elderly population! Like hospitals, nursing facilities can provide you with some outstanding transportation opportunities. You will transport residents to general medical appointments, dialysis treatments, physical therapy and more. You can even partner with the Activities Departments to transport large numbers of residents for special events. There is probably no other source of revenue that is more predictable and stable than dialysis clients. I refer to them as the “Golden Grail” because they are consistent money-makers. Typically, most dialysis patients have to go to dialysis three times a week - and these medical appointments are mandatory! Hence, one of many reasons why the NEMT industry IS recession-proof. It doesn’t matter what the weather is, dialysis patients have to get their treatment. Whether Private-Pay or Medicaid, dialysis patients are always profitable. They offer volume and regularity. Appointments are arranged every other day and typically last between 3-4 hours. You will be able to plan and count on these transports and reimbursements like clockwork. Rest assured Non-emergency Medical Transportation is not just for the elderly. There are students of all ages that need your assistance. Did you ever stop to consider how disabled students get to and from school if they can't ride a typical school bus? School districts need you! With a NEMT business, you can literally contract with school districts and various not-for-profit organizations to transport students of all ages. Save $100 by Investing Online Right Now! NOTE: This is a 320 page Manual that you will download immediately following your investment! There is NO waiting on "snail mail!" You can start right now! This Manual is NOT offered in stores, ONLY on this website. "Joel, I have competitors in my area. Do I really have an opportunity?" Yes! You absolutely have opportunity. Let me tell you, if you have hospitals, nursing facilities, dialysis centers, doctor offices and the like in your community then you definitely have opportunity - it's staring you in the face! Trust me, if you have competitors….they're NOT working for FREE! Your competitors are busy making money. So the question begs, why aren't you? Why aren't you busy cutting a slice of the profitable pie? Let me also add, in speaking from first-hand experience, transports after hours, on weekends and holidays always generate more money! Are you starting to see the BIG picture? Trust me - I'm just scratching the surface! There are so many other ways to make money in the NEMT industry as you'll continue to learn in my ebook, newsletter and associated materials. The opportunities are wide and diverse. Bottom line, the NEMT business IS recession-proof – it’s NOT going anywhere! Demand and opportunity are only going to continue to increase. Think of other businesses that are market dependent. Consider real estate for example. The real estate market has been in the tank and every business associated with this industry has been adversely affected in some capacity at some point in time! But with the NEMT industry, it doesn't matter what the economy is doing - patients on dialysis or radiation could care less if it's a "bull" or "bear" market. Whether the market is up or down, patients have to get to their medical appointments! Likewise with hospitals, Emergency Rooms, discharges, and the like - when it's time to go, YOU GOTTA GO! Depending on your legal structure, there are always tax benefits to owning your own business. With a NEMT business, you have HUGE depreciation costs because of your vehicles and assets. You further have write-offs and benefits to include possible handicap tax credits. The easiest way to make money is to save money. Take what the government gives you with tax breaks and incentives! Although the NEMT industry is growing and is in high demand, it's NOT a high-tech business. You don't need a fancy degree or even prior experience to start and be successful in the NEMT industry. When I started, I had NO prior NEMT experience…let alone ANY business experience! My NEMT business was my very first business! Remember, unlike an ambulance service you do NOT need any special life-saving skills, equipment or training. When you follow my strategies, you're going to be able to do exactly as I did - start with one vehicle, follow a "Controlled Growth" strategy, and systematically build your business. In time, you're going to have more time, more money, and the ability to do whatever you want when you want! Remember, you are a service-based business. Because you are literally going to be helping people you WILL become an asset within your community. You will be helping clients, hospitals, nursing facilities, doctor offices, treatment centers and the like. You are literally helping these facilities to accomplish their daily missions. Think about it…. Without your service, how would doctors see their elderly and disabled clients? How would these patients even get to the doctors? How would hospitals empty their beds to make room for new patients? Without your services, their operation would come to a screeching halt! The list goes on, and on, and on…. Your NEMT business can become a fixture within your community for which you literally leverage to further grow, network and build awesome relationships and partnerships. But remember, as a NEMT provider, you are charged with meeting the transportation needs of your clients. That's it! We are NOT doctors, nurses, nurses-aides or other. But although we are just the transportation provider, we do bring a great deal of help and assistance to our clients. And honestly, bringing help to other does feel good! There are many elderly people sitting in nursing homes with limited family and even fewer visitors. When you arrive to take them to their medical appointments it is, in many instances, literally their outing for day, week, or month. Trust me, by providing these elderly people with helpful and courteous service, service-with-a-smile, it makes them feel special and makes you feel good! Unlike you, when I was starting my business, I had no "How to" Manual to learn how to start my NEMT business. I experienced a great deal of success…but it wasn't without a lot of mistakes too - mistakes that cost me a lot of money that you’re going to be able to avoid! I know the NEMT industry – bottom line. I teach, work with, and negotiate contracts for providers all over the country. If my strategies can work for others, they can definitely work for you. 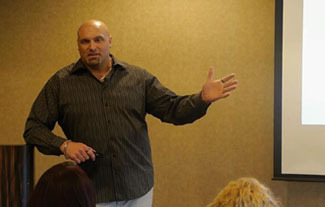 I am going to teach you how to become an asset within your community. Coupled with the dramatic increase in the elderly population, your growth and opportunities are limitless! Let's be honest. There's not too many ebooks on the market of this size and detail. To say I stand by this information and opportunity is an absolute understatement. In fact, if you have questions, call my office at (607) 343-3690. Seriously, we're here to help! If you call after hours or if we are on another line, just leave us a message. We will call you back - we do it every day. Again, we look forward to speaking with you and answering your questions. Again, my office number is (607) 343-3690. To further prove the legitimacy of my ebook and to demonstrate how much I stand by this opportunity, I offer a full 30-day no questions asked money back guarantee! If you are not totally satisfied with this information then please, let us know and we will be more than happy to refund your money. Think long-term. This is a business that is going to last and continue to grow. This is a business in which you can make BIG money and build a legacy. You can keep it, sell it for profit or pass it onto your heirs. If you are like almost 80% of Americans, you have contemplated starting your own business. But, if you have only thought about starting your own business and you can't find the right opportunity, then look no further. I am going to show you how to generate millions of dollars in the world's two fastest growing niche markets – the elderly population and the medical industry. If you're a caring and compassionate person - if you like to help others - then this could be the right business for you. So now, it's about time for us to stop talking and start acting. We have to get down to the business of making money and laying the foundation for your business. Click on the link located below and let’s get started! Don’t forget, join my FREE newsletter and start receiving even more information right away! Note: This information is offered in ebook format ONLY! There is no physical book to ship. There is no waiting on "snail mail!" Invest NOW and you will literally begin studying "How to Build a Million Dollar Medical Transportation Company" immediately following your investment! Who cares more about your financial future more than you? Who cares more about your success than you? The answer is NO ONE! The NEMT industry has been a phenomenal opportunity for me and many others who I have been blessed to work with. Now, it can be for you too! But if you always do what you always did, you will always get what you always got! So, if you are not willing to be decisive and take bold action then you can't complain because nothing changes! And let me not forget the FREE-bees! FREE copy of "A New Opportunity for Additional Revenue!" You'll definitely want to read this! You're going to discover strategies for keeping your vehicles moving around the clock. And the more they're moving, the more money you're making! FREE copy of "Secret Strategies for Financial Success & Independence!" This will provide you with some great insight and overall knowledge and strategies for approaching business on a grand scale! FREE copy of my "Transportation Industry Road Map!" This will give you some great insight on how to evaluate different options for how best to enter your transportation market as economically as possible! FREE copy of my "Shock Report!" A quick read, but a great read providing some great insider tips and strategies relevant to current market situations! NOTE: This is a 322 page Manual that you will download immediately following your investment! There is NO waiting on "snail mail!" You can start right now! This Manual is NOT offered in stores. PS: Please take some time to surf around this site to read and watch videos, comments, and testimonials from others. They're great and well worth your time!